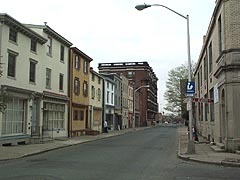 The Hanover/Academy Street Historic District is among the oldest sections of Trenton. 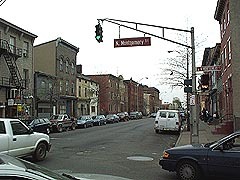 The district was first developed as a residential neighborhood during the city’s initial expansion in the mid-eighteenth century, but later, as nineteenth-century industrial Trenton expanded, it was progressively incorporated into the commercial life of the central city. The eastern boundary of the district, with its basins and coal yards, developed in relation to the commercial growth of the adjacent Delaware and Raritan Canal. By 1850 a significant concentration of black residents was found in the area. The composition of the district changed during more than one hundred years of urbanization. 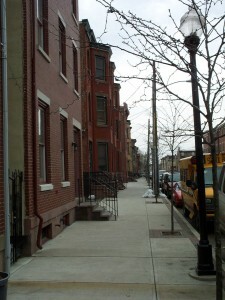 In spite of changes, the brick rowhouses of the second half of the 19th century are still the district’s dominant feature, and provide the connective tissue which ties together earlier and later buildings as well as reflecting a lifestyle based on the proximity of working space to living space (“. . . when everybody went home for the midday meal . . .,” as Trenton’s historian, John J. Cleary puts it). Hanover/Academy is an area of ethnic, class, and physical diversity. This identity makes it representative of urban districts in New Jersey during the second half of the 19th century.